Lode is a small village in Cambridgeshire about six miles, slightly north of east, from the centre of Cambridge and about the same distance south of Wicken Fen. Its one claim to fame is Anglesey Abbey, owned by the National Trust, on the west edge of the village. 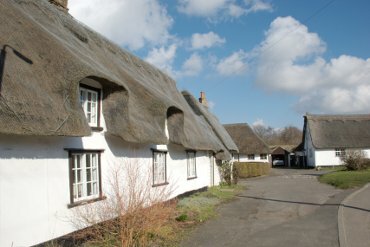 The village, generally, is rather mundane except this area on the main road through the village which features a number of thatched cottages. 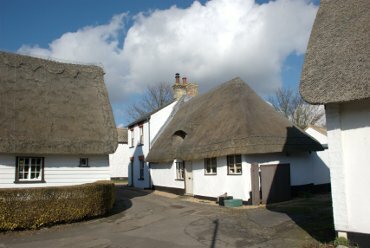 This is an attractive corner with the rather cute little thatched cottage. It is also possible to see Lode Watermill by going down to the end of Mill Lane and crossing the bridge to the public footpath on the other side of the mill stream. The mill is on National Trust property so you can't see much more unless you pay to go into Anglesey Abbey. 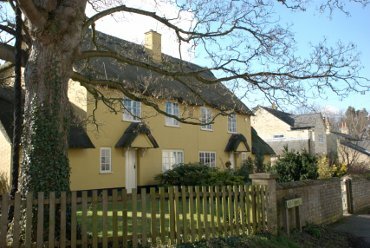 These thatched semi-detached houses were not far from the other thatched cottages. Lode is known mostly because of its proximity to Anglesey Abbey owned by the National Trust. 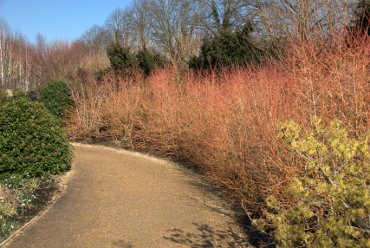 Anglesey Abbey on the edge of the village produces some stunning coloured vistas even in winter as the Winter Garden here shows. The glowing orange stems belong to a variety of Dogwood.